It is estimated that one-third of military and civilian veterans deployed to Iraq and Afghanistan suffer from a constellation of diseases termed Gulf War Illness (GWI). $30,000 is the amount of money needed to procure a piece of technology that will facilitate the use of biomarkers to diagnose and track underlying diseases in GWI patients. And 31.5% is the grade of the hill I intend to climb to help Mt. Sinai purchase this technology. I will race in the Savageman Triathlon, home of the Westernport Wall; a hill with a 31.5% grade, ¼ mile long. If you make it up the hill without falling off your bike, you get your name on a brick placed in the road. I’d like to leave a mark even more lasting than that brick, but I can't do this without you. I am fundraising for Dr. Benjamin Natelson to acquire biomarker technology, so that he can study GWI, Lyme, Chronic Fatigue Syndrome, Fibromyalgia, and other related conditions. Do you know someone with one of these illnesses, someone that could benefit from this research? My guess is yes, given their prevalence. Ten million people in the U.S. have Fibromyalgia. An estimated 2.5 million Americans have Chronic Fatigue Syndrome...but most have not been diagnosed, due to the difficulty in tracking it. And Lyme is the fastest growing infectious disease in the U.S. In 2009, I deployed to Iraq with the Department of Defense as a government civilian (not military or contractor). Like 500k military vets, I have GWI. I was finally diagnosed by Dr. Natelson a full five years after my symptoms began; as a civilian, my access to doctors, treatments, and medications to treat an illness that manifests itself primarily in a military population is limited. Dr. Natelson and his research are an exception, and funding for his work is critical to patients like me. 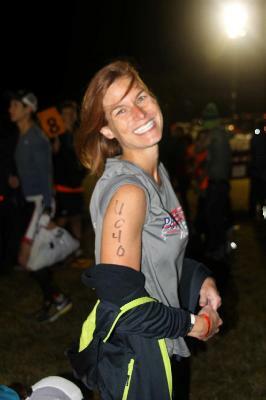 You may wonder how I can compete in a triathlon with such a tough medical condition. My pulmonary dysfunction alone—which leaves me with lung function just 56.9% of a normal person my age—should sideline me from any athletic endeavor. We are only beginning to recognize the restorative effects that exercise has on the body; it goes far beyond improving obesity-related illnesses like diabetes or heart disease. While science has yet to fully understand the internal mechanisms that keep physically fit people from aging quickly, or cancer patients from metastasizing, I know one thing for certain. The more I work out, the better I feel. Josh K. & Kristina P.